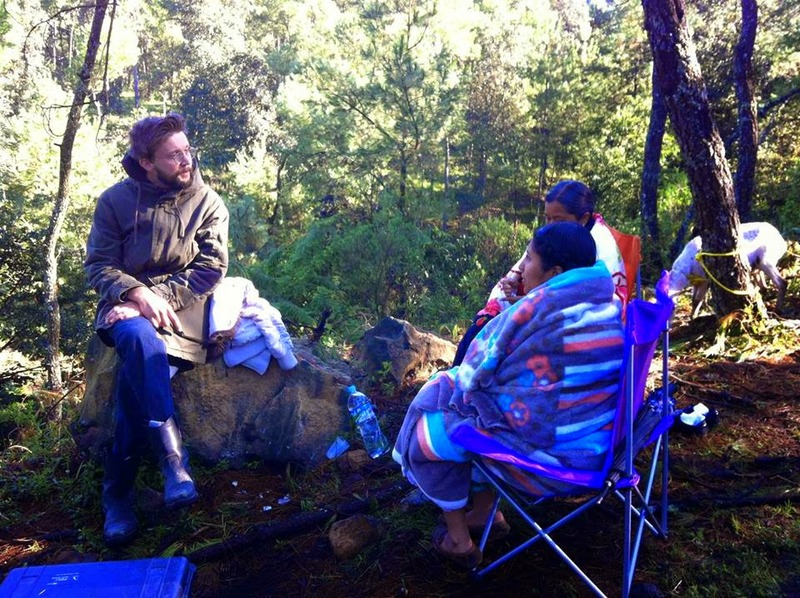 Gust Van den Berghe (left) and actors on location in Mexico on the set of "Lucifer." Photo from "Lucifer" Facebook page. "I hope that I am not boring you with all of this." Not at all. Yours Truly is utterly fascinated by the ideas spewing forth from "Lucifer" director Gust Van den Berghe during our chat over a beer and sparkling wine in the Lincoln Black Label Filmmaker Lounge at Spring Studios. 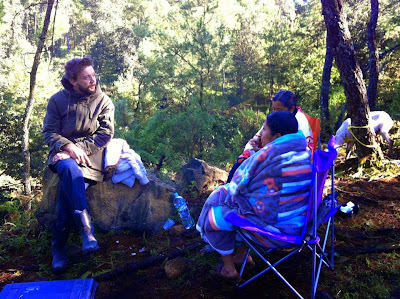 His film, a version of the biblical story of Lucifer that follows the angel during a layover in a heavenly Mexican village en route to Hell, is having its U.S. premiere at the 2015 Tribeca Screen Festival. The last two of its four screenings are this afternoon and tomorrow afternoon. Incidentally, GVdB emphatically states that his film – third in a trilogy – is meant to be seen "in the cinema. I make films for the cinema." Based on the work of the same name by Dutch playwright and poet Joost van den Vondel, "Lucifer" has the distinction of being the first film to be shot using Tondoscope (http://www.tondoscope.com). Essentially, it means it is filmed through a circle instead of a rectangle. From the perspective of the viewer, images on the big screen appear round and have a painterly quality, that of a daguerreotype. The images – as in "Lucifer" – are at once aloof and extremely intimate. Otherworldy; finite; without horizons. This aspect would be lost on a small screen, particularly a mobile device. (See video below, explaining how the Tondoscope process was developed for "Lucifer"). "I wanted to bring new materials to old ideas," he says by way of explanation for his use of Tondoscope. Old paintings of paradise lost that captured subjects in the round also informed the use of this technique. Meanwhile, one is held in thrall by the Flemish director's worldviews – part-intellectual, part-iconoclast, a pinch of existentialism. Consider: he discloses that "I don't think" when I make films. Pressed to expound, he continues, "It's like a negative – a blank – and I fill it in. When you make a mark with your shoe, you were there and this is what you see. You don't think about it. You do it and it just is." Understand? How about this one: "We are immigrants in life – not like the way one usually thinks about immigrants, with borders. But we are in a place in time and these are our experiences without confines." Of "Lucifer," he says "people can think whatever they wish. It is done and I am working on two other films." And then when raised brows confront him, "I am proud of what I have created, and I do not say that to be arrogant." Humility is apparent. GVdB is a filmmaker (and a writer and the son of a writer). He loves the medium. He makes film for the sheer pleasure and artistic expression it permits, a way of communicating ideals, horrors, the human condition. Certainly, not for monetary gain. "Lucifer" does not yet have a distributor, and he has no idea where his team is in the process. "I leave that to the salespeople. If I find a distributor and the film makes money, that is good. But it doesn't matter if it does not." All awards matter, one has to counter. He seems to concede the point, revealing that "Lucifer" took the Grand Prix at the International Film Festival of Tallinn Black Nights (Estonia.) On Friday (24 April), he journeys to Cancun, Mexico for the Riviera Maya Film Festival where "Lucifer" is entered. "For me, being accepted to a film festival is like a reward," he is insisting without a trace of guile. "I don't enter film festivals to win awards." Yet, GVdB is gratified when he does, no? Films/events on today's TFF2015 schedule: "Tribeca Talks: Snap It, Vine It, Tube It,” “Hyena,” “Come Down Molly,” “Slow Learners,” “The Overnight,” “The Diplomat,” “Man Up,” “Hungry Hearts,” “Anesthesia,” “Tumbledown,” “Shorts: NY – Daily Grind,” “Sunrise,” “The Birth of Sake,” “El Cinco,” “We Are Young. We Are Strong,” “Transfatty Lives,” “Good Kill,” “Democrats,” “A Faster Horse,” “Stung” and “Shorts: Family Dynamics” (See video above of “The Arrest”). Visit http://www.tribecafilm.com/festival to learn more about it and the 2015 Tribeca Film Festival, including tickets and schedule.